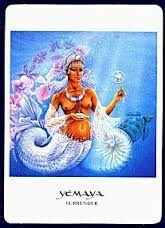 Yey Oma Eja – *Mother Whose Children are the Fish”, or as She is more commonly known, Yemaya, *Mama Watta*, Mother of Waters, Queen of the Sea, Mother of the Fishes, Ocean Goddess of the Crescent Moon, Lady of the Rain, Daughter of the Sea, Constantly Changing Woman, Creator Mother, Patroness of Witches, Sirena. Yemaya. She is known by all of these names and more. 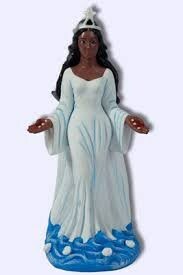 She was originally a River Goddess of the Ogun River in Yoruba. She was a powerful guardian and nature spirit, a Goddess of the African diaspora. When the people of Africa were stolen and brought to lands far away, She came with them, protecting them on their journey, becoming Goddess of the Ocean, on which they unwillingly traveled. She was married to Orungan. When she gave birth to 14 Orisha, the breaking of her birth waters caused a great flood on Earth that created the oceans and the Seven Seas. It is said that even as She sleeps, water gushes forth each time she turns over. Her first gift to humans was a large shell, in which one would always hear Her voice; to this day, we hold a shell to our ear to hear the ocean which is Her voice. She is a Mother Goddess, the Mother of All – home, fertility, life. She rules the life giving, creative and nurturing forces of the sea. She is the Matron Goddess of pregnant women, and spiritual Mother to all who need Her. In Her skirt of seven layers of blue and silver, Yemaya loves to dance. She moves, dips and flows as Her skirt swirls to symbolize the movement of the waves. the fish, dolphins, sea horses, and all the creatures of the sea. Her colors are blue and silver, the colors of the ocean. She loves coral and pearls and aquamarine. Her number is seven. 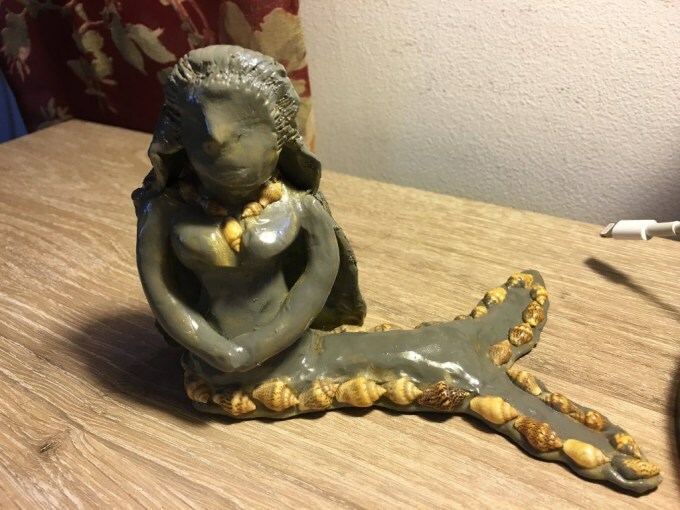 She is sometimes depicted as a beautiful mermaid swimming amongst the waves that are Her home. Her festival days are February 2, the Summer Solsitce and, in Santeria, on September 7. People dress in blue and silver and flock to the ocean beaches, dance and make offerings. Her worship spans the Earth, where She is known by Imanje, Yemanja, Ymoga, Imaga. As water is essential to life, so is Yemaya essential to our lives. She teaches us to be flexible in our thoughts and in our lives, to go with the flow of each event and situation that comes our way, to not become attached as things will always change, as the ocean changes, swirling, churning, constantly moving, ebbing and flowing. In the Goddess Oracle by Amy Sophia Marashinsky, Yemaya symbolizes *Surrender*. 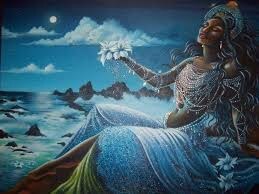 Ms. Marashinsksy states that Yemaya coming into our life “signals a time for surrender”. We give over to Her, asking for guidance, realizing “that the only way through some situations is surrender and open to something greater”. To worship Her, just travel to the nearest ocean, river, sea or lake. There you will most definitely find Her. Walk into the waves, open yourself to Her and find yourself cleansed, reborn, alive. At home, set up an altar with Her image, upon a blue and/or silver altar cloth. Adorn the altar with sea shells, pearls, sea coral, river stones. Light blue candles and incense reminiscent of the sea. Close your eyes. Breathe and focus on Her. Ask for Her protection and guidance. When you are done, be sure to thank Her for any answers She may have given you. with the waters of the ocean of life. like the water, we are flexible, not hard and set.